Native daisy Senecio lautus flowering in our small piece of scrub. Why are you growing weeds? I was a bit taken a back because as far as I knew Senecio lautus was an Australian Native daisy. So what is a definition of a weed? are introduced species from another continent, usually brought in by people knowingly or unknowingly eg. in the padding in saddles in the ‘olden days’. native species which seed all over the place and take over garden beds. Some people don’t mind this but to others it is a nuisance and the plant is therefore a weed. Senecio lautus may come into the latter category, but I don’t mind at all. Bring it on, I say. They flower among the mallee trees on our block, come up in pots where I don’t want them, flower prolifically along the South Eastern Freeway on the way to Adelaide and give a glorious glow of warmth on cold cloudy days. They are easily pulled out if not wanted in a specific location. Some appear to be perennial up to 60-70cm tall, others flower at about 30cm, some require cutting back after flowering to maintain a neat bush. Many just appear to die back and re-shoot when it rains in early winter. I consider them worth having, but of course once you have one seed in the garden you are likely to have them next season whether you want them or not! 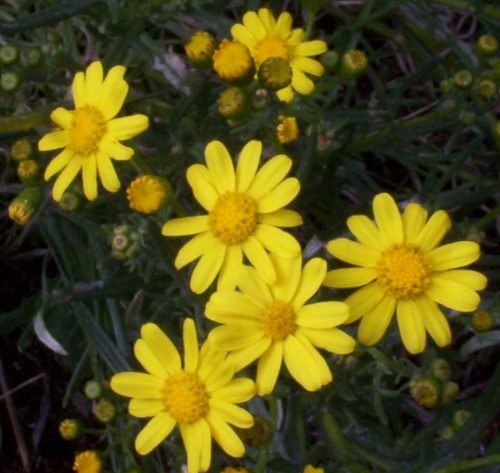 Find out more about Senecio lautus. I picked some yesterday morning in an experiment to see if they would last as a cut flower. I hadn’t bothered to try before. I will report back. One thing I did notice is that some flowers closed their petals last night.